Better stopping power for your carbon hoops. With this in mind, ENVE put the same amount of energy into their brake pad as they did for their advanced carbon rims. The result of this integrated design is a unique compound that's specifically constructed to manage heat, modulate, and wear slowly on ENVE's full carbon brake track -- rain or shine. 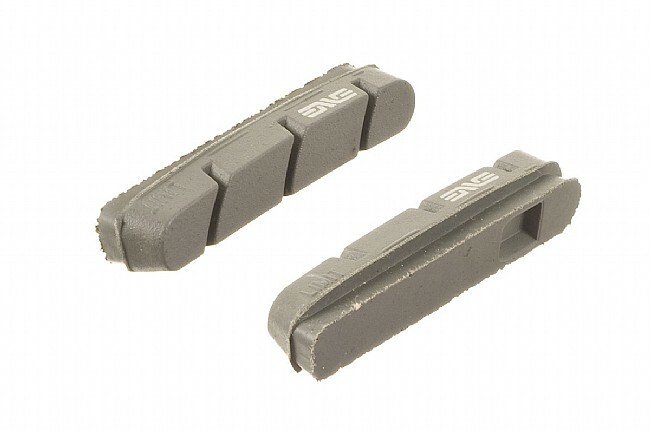 ENVE Brake Pads are sold in pairs, you'll need to order two sets for a complete bike. They're available in Shimano/SRAM and Campagnolo compatible versions. Note: These pads are officially recommended for use on ENVE carbon rims. They may not be recommended for use on carbon rims from other manufacturers and are not compatible with aluminum braking surfaces.